Last Sunday I made a brief stop in the village of Beckington, Somerset. The posters were still advertising Beckington's Jubilee Day, June 23rd, with lots of Union Jack bunting. So I'd just missed it, but never mind, that isn't why I'd stopped by. 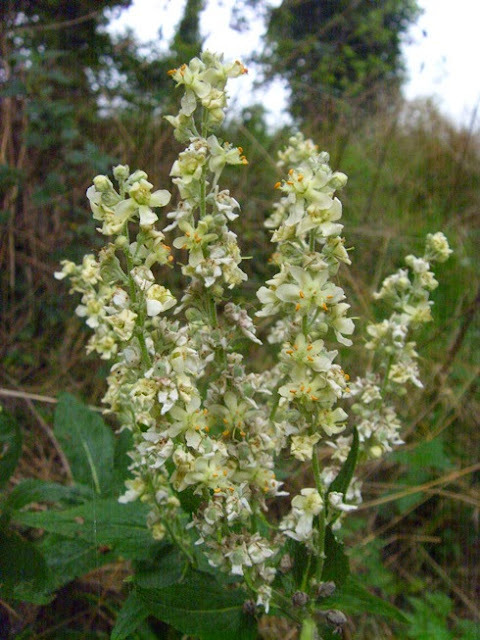 But what I'd really come to inspect was Beckington's apparently vanishing colony of White Mullein (Verbascum lychnitis). I've lived in or near Frome for most of 20 years, and it was almost as soon as I moved here, in the early 1990s, that I spied the White Mulleins growing on a broad verge at the edge of Beckington village (a couple of miles north of Frome). The front part of the verge is flat; behind it is a slope. In those days the colony was flourishing, with anything up to fifty plants. 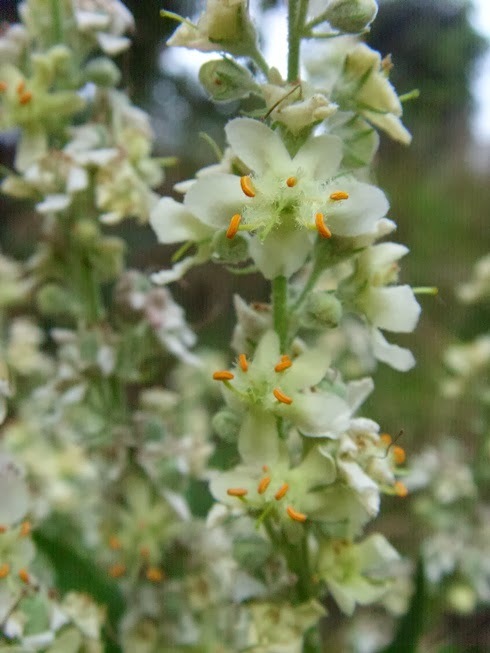 White Mullein (Verbascum lychnitis) is generally a scarce and local plant in the UK, though it has some strongholds - I seem to recall that Glamorgan is one, and another (perhaps more unexpected) is Croydon. The species can also be found at the opposite end of Somerset, near Minehead; in this case, uniquely for Britain, in its yellow-flowered form. When R.G.B Roe published Flora of Somerset (1981), the white-flowered form was not known anywhere within the county. Roe noted an old isolated record from the village of Beckington (it was in 1791! ), but he supposed that this was just one of those casual individuals that turn up in odd places and are then never seen again. A few years later, the Atlas Flora of Somerset (Paul Green, Ian Green, and Geraldine Crouch, 1997) records the remarkable reappearance of V. lychnitis in its historic location. Anyway, since 1992 or thereabouts I've been making intermittent drive-bys to keep an eye on the colony. And a few years ago I realized that it was in decline. By the early 2000s, driving past in July, I often saw only a single plant. These single plants were now confined to the slope, there were none in the larger flat area. I wasn't sure why this decline had set in, though I supposed that the maturing of young trees on the bank (mainly goat willows) had a lot to do with it. I remembered too that in the glory days of the colony, the verge was regularly visited by traveller caravans and grazed by the ponies. Now I no longer saw them. Had the mowing pattern changed, I wondered? When I stopped by to look more closely, I think in 2007, I found only the remains of the previous year's flowerer (these skeletons last a long time, and a lot of the fruits remain on them), plus a single first-year rosette, whom I'll name Margaret. In 2008 I was back again, expecting Margaret to flower, but she didn't. Though the plants are biennials, it seems that if the conditions don't favour flowering then they can repeat the vegetative Year 1 more or less ad infinitum. Occasionally, so I've read, Year 2 (i.e. the year of flowering) may also be repeated, but that's something I've never witnessed. Normally, flowering is the end of the line. For a brief period in 2008-9, I appointed myself a sort of unelected guardian of the colony who pleaded with councils and other bodies for various kinds of help. The only definite result I achieved (from Beckington Parish Council, in this case) was a slight increase in the area that was left unmown. It didn't do any good, so far as I could see: no mulleins ever emerged in this 5m curtain of flat ground, and in 2014 the mowing was once more extended to the base of the slope. Witnessing at first hand the sluggish incompetence of local government, or the well-meaning do-nothings who begged "to be kept informed" of my progress, was a sapping experience. Being a civic campaigner is no picnic. Nevertheless I'm not altogether sorry that I utterly failed to dynamize SCC into getting a grant to pay for scrub-cutting contractors. I had very mixed feelings about it. I don't like meddling with nature. 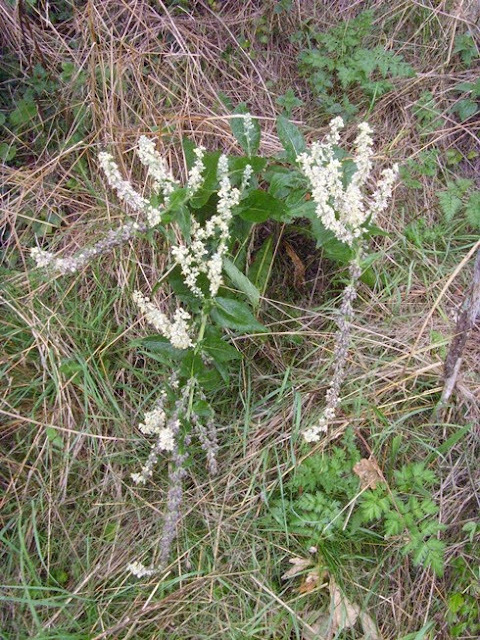 And I am just as capable of being sentimental about a goat willow as about a white mullein. 2009: Margaret continued in rosette form. An overhanging willow bough was discreetly cut back. 2010: Margaret finally flowered and died - the first time that the flowers had been seen for four years.. Another rosette was discovered on the edge of the unmown area (we'll call him Maxie). 2011 Maxie flowered and died. No new rosettes seen - not by me, anyway. A visit by members of Somerset Rare Plants Group on 13th August 2011 apparently found two damaged rosettes in the mown area. 2012 On a second visit (27/6/12) I found a new healthy rosette (named "Mutex") on the unmown bank, in a promisingly unshaded spot. 2013 Mutex flowered and died (I finally got some reasonable photos). I didn't find any new rosettes. Two other significant things happened this year. The first thing is that someone (presumably the parish council) decided to plant a few saplings on the mown part of the verge. Whether this is good news or bad news I'm not sure. It will cause a bit more shading, but it may also impede blanket mowing. The second thing is that some travellers stopped by for a week, and that's definitely good news. This was in September, I think. I was able to confirm that their ponies avoided the White Mullein but cropped everything else (this is the same reason that Meadow Buttercup and Vervain do so well in horse-fields). Hopefully the ponies' hooves also cut up the soil a bit. 2014 One new rosette seen (Mildred). They are pear trees. I was wrong in thinking they'd impede mowing. In fact the verge is now close-mown right back to the bank (my 2009 concession from Beckington Parish Council having been completely forgotten, once we stopped repairing our bamboo markers). 2015 Mildred flowered. She was in pretty much the same spot on the bank that Mutex was - the only unshaded spot. As with Mutex two years earlier, the main stem bent right over and draped itself down the bank, which makes it look even less photogenic. I didn't get round to visiting Mildred until September 27th. There were lots of new flowers and buds, along with lots of mature fruits; this was a good example of the "second flush" that I mentioned earlier. I also found three new rosettes, Mel, Mew and Miaou. Mel is about ten meters to the south of the aforementioned spot. Mew and Miaou are almost directly below it, and are so close together they're getting in each other's way. All three are unusually small, especially Mew, and I don't expect them to flower next year. All three are on the edge of the mown area, which will be problematic unless I rope them off. Nevertheless it's nice to see four plants at the same time. The site is more shaded than ever, so I wonder if this reflects the occasional manual placing of seeds that I've done over the past few years, or maybe the travellers' visit in 2013. 2016 I neglected to make any contact with Beckington PC, with the inevitable result that early close mowing has destroyed the three plants seen last year. Rather depressing. I think this is the first year when I've seen neither rosettes nor mature plants. 2017 A very hot, dry spring and summer. Three rosettes appeared, one in the traditional "safe" position on the bank, the other two in highly vulnerable mown areas. We can't be bothered to make up any new names for them. We possibly can't be bothered to resurrect the bamboo canes either, but at least I'm thinking about it. When I first saw the colony, the scene appeared to me peacefully immemorial. Of course that was the common in-comer's illusion. Only two years previously, in 1989, the Beckington by-pass had opened to the east of the village. The road that the mulleins grow alongside, now purely a local route between Beckington and Frome, would up till then have been the A36, the main approach to Bath from the south. It must have been choked with traffic. On Roe's evidence the white mulleins were unknown before 1981. But it's inconceivable that this vibrant colony, as I first saw it, could have passed unnoticed for very long, I'm guessing the mulleins just existed for a long time as a seedbank and then something happened, not very long before I came to the area, to kickstart long-dormant seeds into germination. All mulleins respond to soil disturbance, and maybe this disturbance occurred around the time that the Beckington by-pass was built. Perhaps scrub was cleared from the bank. But it remains a mystery: my sources (i.e. Laura) tell me that there weren't any obvious changes on this spot. Despite my own limited success, I can be confident that the site still holds a healthy seedbank of V. lychnitis, patiently waiting for the right stimulus to re-emerge. It may take a century or two. White Mullein doesn't photograph well. A close-up gives little idea of the plant's impressive size. But when you photograph the whole plant you can't see any detail in the inflorescence, which just looks greyish. Only a few flowers are in full bloom at any one time. 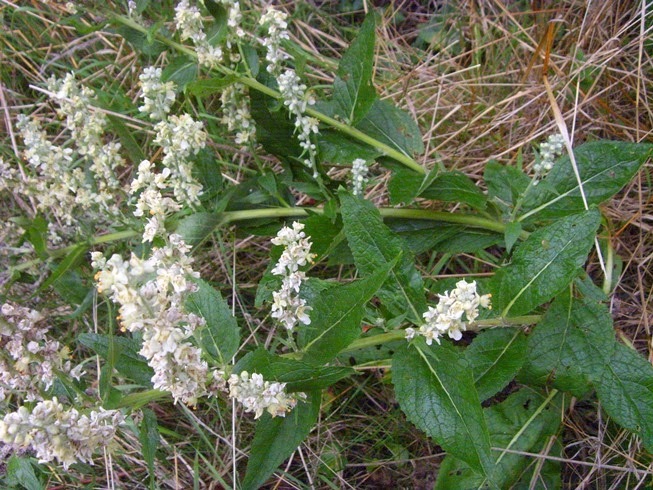 (The main flowering time is July-August, but the stems sometimes produce a scruffy secondary flush in October). The flowers appeal strongly to bees. White Mullein from a distance. This was "Mutex", photographed on 28th August 2013. Clearly Mutex's main stem suffered a mishap sometime in the spring, so is bent over (the base of the plant is towards the top of the photo above, and towards the right of the photo below). 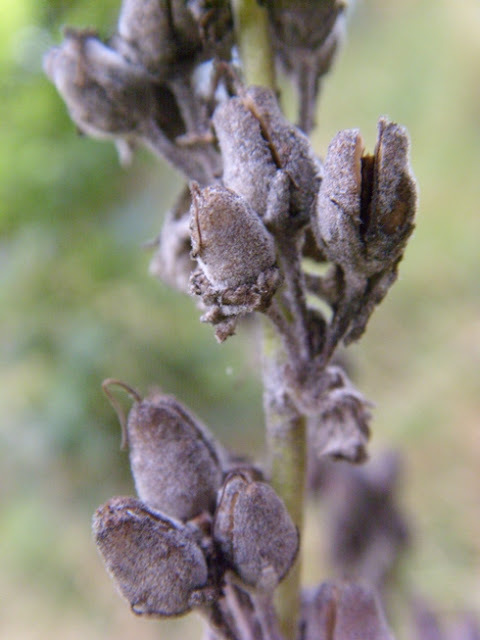 Base of the flowering stem. (Above) First-year rosette in shade, June 2008. 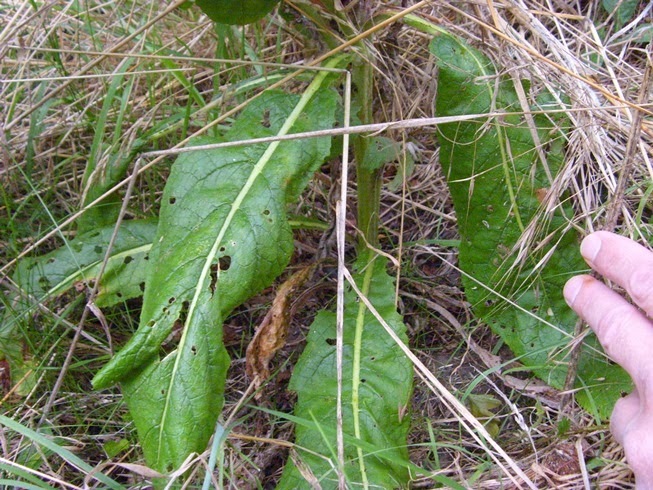 (Below) rosette damaged by mowing, June 2008. (Above) Fruiting stem, September 2010. Over at Intercapillary Space I've posted a mini- bibliogaphy raisonee of Patricia Scanlan's Ink Sculptors press. http://intercapillaryspace.blogspot.co.uk/2012/05/patricia-scanlan-ink-sculptors-press.html . I'll try and keep it updated with any more information that I get (for example, in the past couple of days I added in a bit of information about Máire Bradshaw, one of the authors). Seems a pretty nice example of a small art/poetry press (1988-94). What led me to check it out was reading through a volume by Scanlan herself; I became even more intrigued when I found Richard Makin and Jeremy Reed among the authors. In my personal pyramid of greatness, Makin is near to the very pinnacle. Some of the others are the kind of thing that I might in the past have put by as ephemeral, domestic, amateur, of strictly local or temporary interest. (And I suppose I still make those kind of judgments when I'm rummaging in a second-hand bookshop.) But as a relativist, I have to consider that all the other authors are each just as great as Richard Makin in their own ways. How can this be? That's the kind of thing that fascinates me: what relativism does to your perspective, the questions it asks. This is in honour of the new book I bought last week, which is: Alan H. Sommerstein (ed), Aeschylus: The Persians and Other Plays (Penguin Classics, 2009). I am a Penguin Classics baby, born and bred. But this is the first new one that I've bought for a while. It apparently sits alongside, rather than replacing, the earlier volume by Philip Vellacott (Prometheus Bound and Other Plays, 1961), which is still advertised in the end-papers of the newer one. (Likewise, Vellacott's The Oresteian Trilogy managed to coexist with Fagles.) Perhaps Penguin believe that some readers will continue to be attracted by Vellacott's cleaner pages and his more flowing blank verse, or maybe there's simply not much point any more in designating books as out of print. But Sommerstein has nearly twice as many pages, more information, and more up-to-date scholarship (nevertheless, it has limited scope : - you won't learn anything much about performance history, or the post-classical critical heritage, or about feminist or continental-style or historicist readings of Aeschylus). 84. remember Athens: Cf. on 285. The only way to follow this cross-reference is to flip back to the text (of The Persians, in this case), locate line 285, find the footnote number on that passage (which is, in fact, 32) and then return to the notes to find out what it's saying. Hmm. This is the kind of thing writers often have to resort to while they're still pulling their notes together, but they're supposed to go back and clean it up after they've finished. Aren't they? Sommerstein's translation is taken over wholesale from his three-volume Loeb Aeschylus. This isn't an entirely happy piece of short-cutting. In the Loeb, the translation sits alongside the original and is designed, really, just as an aid for students reading the Greek. But here, very little reference is made to the Greek text. The (rather few) mentions of Greek words are all transliterated into the Roman alphabet; in fact the Greek character set does not get used at all. The notes generally don't include any discussion of textual reconstruction or variant translations or difficult cruces. I'm not a Greek scholar, but surely there must be plenty of those. to our wandering, <so that we speak in manner no one will censure>. PROMETHEUS: < >! That is how one ought to insult the innocent. I suppose this fragment was constructed from painfully reassembled flakes of papyrus. But we need a bit more explanation, particularly about those bracketed characters within an English word. This word for 'king' is not Persian but apparently comes from the Phrygian language of north-western Asia Minor (Pseudo-Plutarch,On Rivers 12.3-4); in Sophocles' Shepherds, whose setting is Troy, the Chorus use it in addressing (Priam or some other prince) (Sophocles fr. 515). Maybe a scientific manner seems appropriate when you're talking about the Fragments. I'm not writing all this intending to impugn Sommerstein's hard work or to have a whinge about declining standards (but I must admit that fault-finding is great fun). In truth I think this book is a terrific, informative and very enjoyable addition to the series. And above all, it makes Aeschylus more available to a Greekless reader like me. That's all that matters, isn't it? What my observations are meant to register is a cultural change intermixed with an economic change. If Penguin Classics can no longer afford proof-reading editors, or to commission their own translations of classical texts, that's partly an economic matter but it's also partly a value judgment: these things don't seem as important as they once did. And that must go with a changed perception of what kind of audience a book of Aeschylus' plays is likely to command. As an audience we aren't, it seems, so concerned as we used to be about having a version that acts, nor with being offered an assimilable flavour of Aeschylus's tragic grandeur (Aeschylus as English Lit). But we expect fuller disclosure and we're prepared to work harder; we accept that an interest in Aeschylus is likely to involve a bit of archaeology. These play-titles are probably not Aeschylean (maybe the individual sections of a tetralogy didn't even have titles - Sommerstein's suggestion). But they are the names that emerged as soon as other authors or theatre producers or scholars wanted to talk about them. It's a striking fact, even if it's mainly an accident, that the earliest surviving European drama is seriously interested in non-Europeans. Sommerstein emphasizes the unexpectedly multiculturalist implications, e.g. the unqualified sympathy for the Persians in their time of disaster, the assumption of common human emotions and values. He doesn't mention the very different views held by some other commentators, e.g. that in The Persians we witness a maturing identification of Asia with "the Other", that the foreign setting is really just an ingenious way of paying compliments to Greek success while branding Asian culture as barbarian, that is, exotically different and ultimately inferior, and un-democratic. The play-text supports both views to a certain extent (and they are not merely opposites). Either way, it tends to emphasize that Aeschylus, understandably, has very little inwardness with Persian culture, and this consideration is slightly depressing; I'm finding it the hardest of his plays to like. The context doesn't provide much assistance. If the Hypothesis is to be credited, then Aeschylus won the 472 competition with a group of four plays that are, to say the least, wide-ranging; the others tell stories from the heroic age, unconnected either to each other or to The Persians. We naturally take our ideas about connected plays from the only surviving trilogy, Aeschylus' Oresteia. That is a very closely-knit group of three tragedies, telling self-contained but vitally-connected episodes in a single story. Maybe the reason for this unique survival is because it was exceptionally closely-knit. Nevertheless it seems likely that the trilogies that contained Seven Against Thebes and The Suppliants were also of this type. But it also appears that a trilogy could be, as in this case, a much looser medley whose thematic connections (if any) were little more than ornaments. Each play really stood on its own. (By the time of Sophocles and Euripides these looser aggregations had become increasingly the norm.) So we have to take The Persians on its own merits. Sommerstein's book really comes into its own with The Suppliants. His account of the Danaid trilogy (and satyr play) is persuasive; few fragments remain of the other three plays, but we begin to see a shape emerging that convinces because of its resemblance to the Oresteia. The overarching theme would then be the claims of Aphrodite, which would have come to the fore in the third tragedy (The Danaids) - in the end, Greek tragedies always seem to come down to the will of the gods. We can see this theme bubbling under the main action of The Suppliants and becoming exposed in its coda; we don't know for certain whether it was the first or second tragedy, but Sommerstein argues that it was probably the second. The main action of The Suppliants, however, allies it with later suppliant plays: what is the Greek city-state, in this case Argos, supposed to do with these unwelcome foreigners? It was evidently a hotly-debated topic then, and of course it still is. Other plays that dwell on this theme include Sophocles' Oedipus at Colonus, and Euripides' Children of Heracles, Suppliant Women and, to a certain extent, Phoenician Women (where the Chorus are foreign exiles living in Thebes). Once the most read of the plays of "Aeschylus", but its untypicalness does seem fairly apparent when we come to it forewarned by scholarly doubts.